How we wanted to love Cha Cha Moon, the Chinese fast food emporium created by Alan Yau of Wagamama fame. You see, we love Wagamama. Perhaps too much. We eat there all the time and have for years. 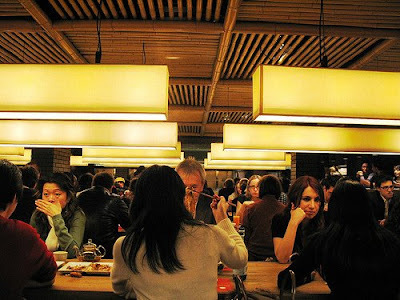 We recommend Wagamama to everyone who comes to London as the best fast, inexpensive meal in town but after the 1000th Chicken Chilli Ramen, one starts to wonder if there is some other place to eat that is cheap, cheerful and good. Alas, Cha Cha Moon is not that place. Despite being in a fantastic location near Carnaby Street (with another outlet opening at Whiteleys Shopping Center in Bayswater this weekend), despite the hip décor, and despite being really cheap with main courses ranging from £3.40 to £5.50, the food at this Cha Cha Moon is just not very good. We had three different main courses with noodles: chicken, crispy duck and seafood. As Eloise, who is always a good eater, picked politely but unenthusiastically at her chicken, we were in perfect agreement that everything was OK but not great. And such is the demand for cheap eats in London that despite being mediocre, unless you get to ‘no reservations’ Cha Cha Moon early, you’ll be waiting a long time for a seat. So it’s back to Wagamama for us. When we want Chinese, we'll head for one of the twelve Ping Pong Dim Sum outlets instead. Its not so cheap but oh, so much better. For cheap and cheerful Indian, we head for Marsala Zone. Anyone with suggestions on how to eat well in this town for under a ‘tenner’, we would love to hear from you.